This is great news! You'll hear from many of us on this! great news I shared to post on my face book page. One of these days I will be getting one from you. Wish I had that when I built the Zip!!! Definetly on my list for the next boat. excellent! i will be buying one soon! Brown - 7/16", 5/8" & 3/4"
Redwood - 5/8" & 3/4"
They have limited quantities in stock. Tell me, since they will accept a stain why would you want them colored? 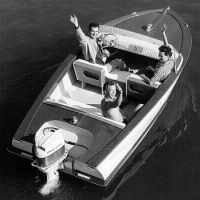 I gotta find another boat to build so I can justify buying one of these Gayle! Gayle, some may not want to stain their boats, but finish them natural. If that is the case, then they may want brads that are as close to the natural color of the wood as possible. I'll have to keep this in mind when I get ready to start!